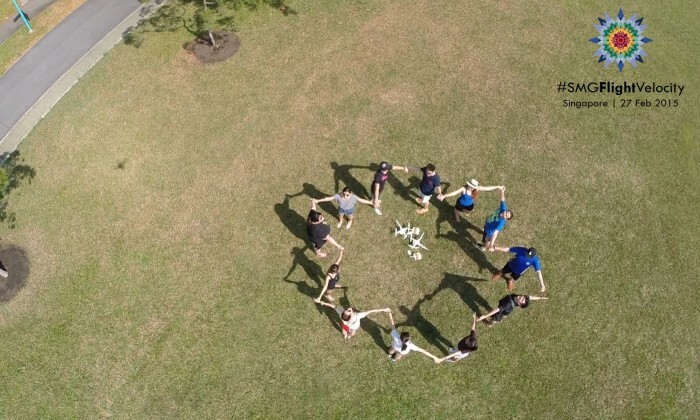 Drones are all the rage at Starcom MediaVest Group’s Singapore office in March, as the advertising company held an employee learning initiative educating staff on flying drones. SMG staff were taught the basic operations of how to fly a drone, take-off, land, navigate the skies, take high-level aerial views and create content for clients campaigns. The syllabus also covered air regulations in Singapore surrounding usage of drones. “Apart from learning how technology plays a part through our evolution to embrace content creation into our business, drones best reflect how we are living in a time where creativity is commoditising as fast as privacy is dissolving,” said Ian Loon, head, digital leadership, Southeast Asia Starcom MediaVest Group. Using drones in marketing is not new to the region as more and more marketers experiment with the device. Last year, Coca-Cola partnered with the Singapore Kindness Movement where it dropped free cans of Coke to foreign workers. Remote controlled drones were used to drop off boxes of Coke to more than 2500 workers around Singapore. Meanwhile in Malaysia, 100Plus created a race, pitting runners against called The 100PLUS Race Against the Machines. The event was created to look like a real life video game and was organized by integrated agency Mitosis. Participants had to dodge, hide from and outrace airborne drones set loose to “hunt” them. “Drone-flying added a new dimension to addressing conversations with clients and consumers where the needs to build a brand through an addressable moment and not through the paid space. It is part of our forward-thinking, adaptive culture within the company” said Joshua Kwah, director for strategy & growth Singapore. The train compartment booth was done in real-life scale with two colourful mascots which looked to attract passengers at Kowloon s..
"This was an unsanctioned act by one of our store staff that we disapprove of completely. We are so sorry for the hurt this has ca..